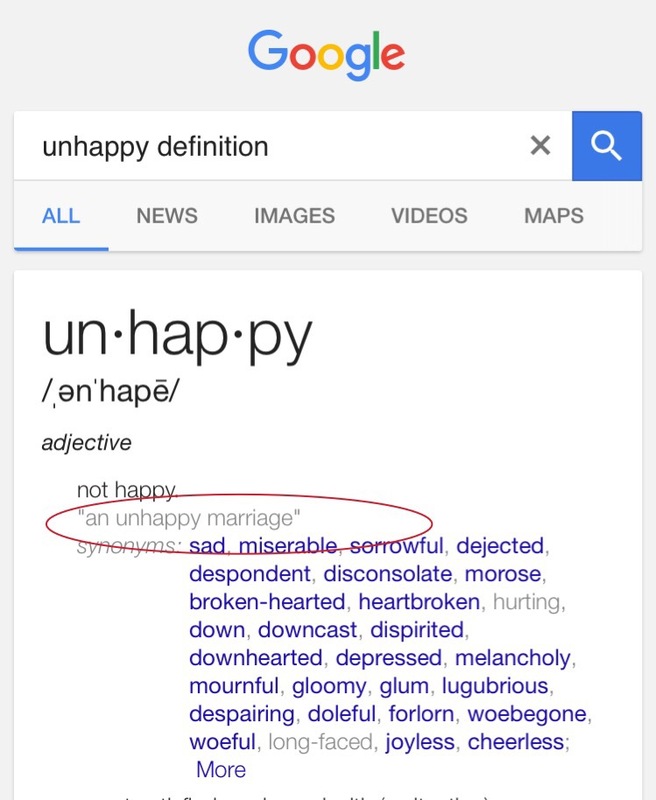 Did you notice that the example given is “an unhappy marriage”? Aside from this Googled definition, I’ve interviewed and written about twelve unhappy wives and here is what I’ve learned. Wow, nice synthesis! I am going to have to read your book soon, as engagement is around the corner for me. Reading some of these makes me realize there are always some thangs to be more aware of and fine tune. Please do! What people have been saying is that it’s much more than a book just about wives or women, but rather, it’s a book about relationship behavior with which anyone can relate. Kelley’s review actually kind of shows some of this. Exactly. That’s one way you know there’s an issue. Have you ordered your copy of the Unhappy Wife yet? I did and I’m looking forward to reading it! That is sad. I tend to be a bit of an optimist though. I hope one day culture will shift so that wives cab liberate themselves. Sounds like a good read, especially for the ones who haven’t been married yet either. Looking forward to it. Best wishes to you! Thanks KP! It can be helpful so that you can kinda see what you feel you can tolerate because a few stories are not the typical “unhappiness” you’d think of. Congratulations & best wishes for your book !! Looking forward to it !! Seriously, cannot wait to get the paperback! Thanks Lennon! Doing a giveaway tomorrow and I’m adding you to the list of people to give away to! Awe, you are the sweetest! Thank you Darling! This book gonna be the good good! Lol! Real Talk! Very intrigued by this and now awaiting it arrival! Definitely will be adding it to my collection!! Thanks Mitch! I’m a bit anxious for readers lol. You did a great job of making something so informative very interesting. Looking forward to more. Thanks Joan! Looking forward to you and everyone’s read and comments! “It’s time to pay your bills” made me angry. My bills ? Uh ? Happy bachelor since 1984.
lol – yes financing a relationship is no bueno. Thanks Debbie! You’ve given me something else to think about. I wonder how other “unhappy” wives would categorize themselves. Thanks for the encouragement. I know right. Getting excited for you all to read. Some good premarital advice, you think? For sure! And make sure he does the same.